Feel free to contact us when you need directions. * Take the N4 Witbank Road from PTA / JHB – past Witbank, Middelburg, Belfast. * Turn off – right – to Machadodorp. * In Machadodorp take the Badplaas Road (turn left at the Dutch Reformed Church) After 20 km on the Badplaas road turn RIGHT at the Bloemfontein sign. * The 8 Km dirt road to Bermanzi starts here! Go past the Old School Trout Lodge to a T-Junction and follow the red & white Bermanzi sign boards. * Turn RIGHT at the T-Junction, and cross a low water bridge, past a farm house and chicken farm on your left and a Telkom tower on your right. * After the road turns slightly to the right you get a Bermanzi sign on your left hand side. Turn LEFT here. Go through a gate and turn SHARPLY left on the farm road. Drive slowly. Follow the double track through several gates. The first gate’s lock must be opened with the supplied lock code. NB. The supplied code must be entered with the lock levers straight in line with the mark on the lock. Press lock inward and pull open. Please lock the gate again after you have entered. 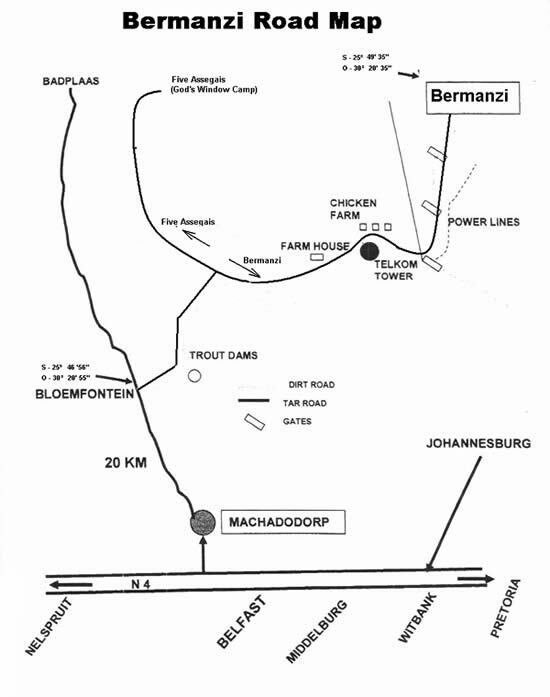 * Follow the arrows up to Bermanzi. GATE LOCK CODE: will be supplied on confirmation of booking.